Location/ Directions: I-81 North Take exit 143 onto Interstate 581/220 South Take Exit 3E, Hershberger Road Move over into the far left lane Take the Aviation Drive/Airport exit Move over into the airport terminal entrance. About Hotel: NEW! 5-Floors, 93-Rooms, Interior Corridors, No Pets Allowed, Business Center, High-speed Internet Access, Health and Fitness Center (On-site), Indoor Saltwater Pool, Indoor Pool, On-site Guest Self-Laundry Facilities (washer/dryer), Daily Housekeeping, Dedicated Lounge, Ice Machine, Convenience Store, Color Cable / Satellite TV, Stereo, Work Desk w/ Lamp, Two-Line Speakerphone with Voice Mail, Bathtub, Hairdryer, Private Bathroom, Coffee Maker, Microwave Oven, Mini Refrigerator, Connecting Rooms, Double Glazed Windows, Individually Controlled Air Conditioning, Iron/Ironing Board, Rollaway Bed/Cot (fee), Suites with Dining Table, All rooms non smoking, Restaurant (on-site), Free Continental Breakfast for all guests. Railroad View: Expect a Fair View. You need a room on the rear of the hotel. There should be a clear view at the grade crossing. 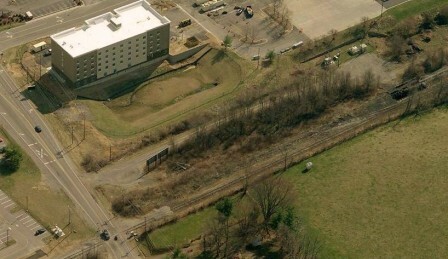 Railroads past Hotel: Railroad ? Lightly used branch line. Line is active for one customer located north of the hotel. The Huckleberry Trail (walking / bike trail) runs along this railroad line. Photo Comment: Due to the lightly used nature of this branch line, we considered not listing this hotel. Chanches of seeing a train during your stay are extremely slim to none. The hotel can be seen in the left corner of the aerial picture.